A hike not to be missed - Jim Lacefield rarely leads hikes and his geology talks are magical transports back in time to when Alabama was an ancient sea filled with mysterious creatures. On this hike, “geology rocks” as guests explore natural and man-made rock formations and discover why Red Mountain Park became the site of iron ore mining activity for nearly 108 years! Join professional geologist, expert historian and local authors Jim Lacefield and Thomas Spencer during this 2 mile moderate hike. As an added treat for hikers both Jim and Thomas will be autographing their newest books! 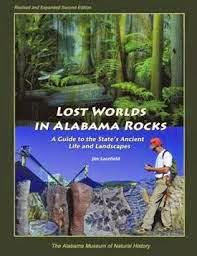 Jim’s book “Lost Worlds in Alabama Rocks” describes the underlying geology, history and special nature of Alabama’s rocks. Thomas’ book “Five-Star Trails” describes great hikes within a 75 miles radius of Birmingham. Free. Please note that this is from an evolutionary (not creationism) point of view.